Glossaries are designed to improve understanding of data’s context and usage. Glossary terms not only have descriptions of their meaning, but they also define business context of use and can be linked to the underlying technical metadata to provide a direct association between business terms and data sources and data elements. 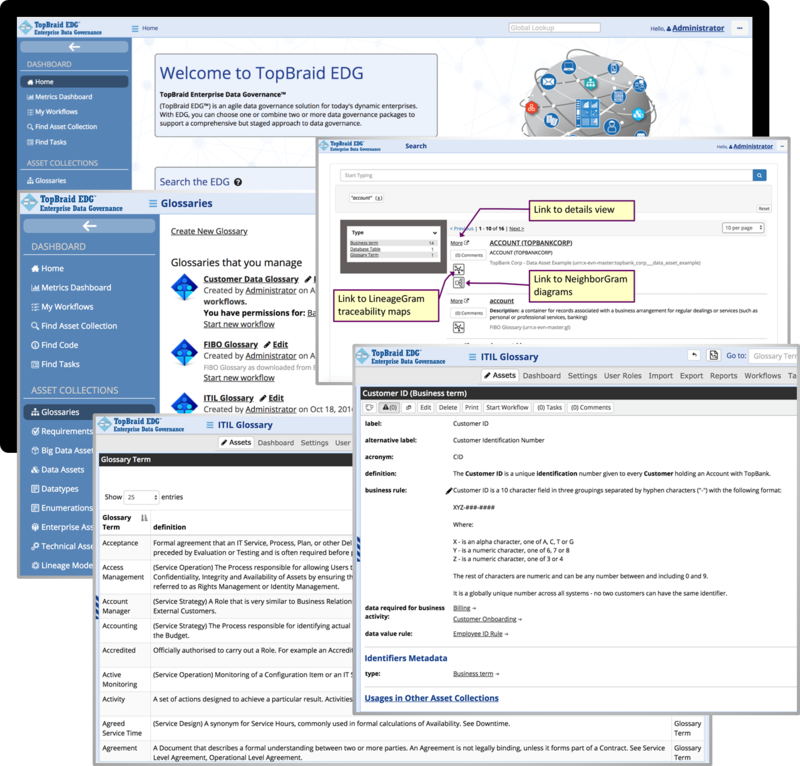 To enable connection of business and technical metadata, business glossaries are included in TopBraid EDG–Metadata Management. Alternatively, business glossaries can be used on their own – as a starting point of your data governance journey, or combined with TopBraid EDG–Reference Data Management. Glossary terms can be categorized in a way that is relevant to your organization. Multiple glossaries can be developed, interlinked, searched and explored. Valid definitions of values and business rules can then be managed and made available across the organization. Intuitive Graphical User Interface – with auto-completion, drag and drop, tree and tabular views and rich text editing. Flexible Data Model – ability to define and use any number of custom attributes and relationships for your business terms. Audit Trails – every change is logged and time stamped, change history can be searched, changes can be rolled back if desired. Workflows and Working Copies – pre-built and custom workflows with associated virtual work-in-progress copies to support data governance review and approval processes. Role Based Views – business stewards, subject matter experts and other users can have different views of the terms based on their governance roles..
Configurable Governance Roles – for business areas and data domains as well as for individual glossaries. Reporting and Dashboards – Built-in reports and configurable role-based governance metrics. Advanced query-building tools and reporting through graphical interfaces. Search – simple lookups and advanced search, saved searches and search services..
Data Quality Rules – built-in rules and constraints available out of the box. Custom validation rules to enforce best practices and ensure high quality of your business glossaries. Business Rules – define semantics of your terms and their relationship to data using highly expressive, executable rules. Connect Business Terms to Other Assets – when integrated with EDG-MM and/or EDG-RDM. Visual dashboards to explore and drill down lineage, traceability and impact information from the business terms perspective.. Automation of Linking – Maps between business, technical and operational metadata can be auto-generated. Import/Export – Import/Export from Spreadsheets, XML, Databases, SPARQL and GraphQL endpoints, RDF/OWL. Native Support for Semantic Standards – Built-in support for W3C standards such as RDF, SPARQL, SHACL and OWL. RESTful and GraphQL APIs. Enterprise-readiness –Easily extensible, highly scalable and robust architecture with high availability, single sign-on through LDAP/Active Directory integration, integration with enterprise systems through built-in connectors, web services and JMS. Learn how to create a glossary in TopBraid EDG and populate it with terms, definitions and related descriptive metadata. Learn how semantic data management systems unlock the true meaning behind business’s data. This short video demonstrates available search features using a business glossary as an example. Different types of knowledge graphs organize the way you can manage a complete range of assets and use cases. Learn the business value delivered as a result of Business Steward’s work improving the quality of business data. Explore documentation for users, and administrators while learning more about the TopBraid Business Glossaries.